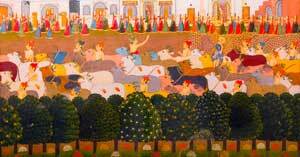 Govardhan Puja, also called Annakut, is observed as the day Krishna was victorious over Indra. It falls on the fourth day of Diwali (the Hindu festival of lights) which is in the month of Kartik. Govardhan Puja is celebrated in different ways as part of the Diwali festival. Men give gifts to their wives, the New Year, Vikram Samvat, starts this day, and the worship of tools one uses daily. Government and businesses are open as it is a restricted holiday. Lord Krishna had the people worship Govardhan (a manifestation of Krishna), the Supreme Controller of nature. Lord Indra, the God of Rains, was not to be worshipped in return. Annakut (meaning heap of grain) symbolizes Lord Krishna lifting up the mountain of Govardhan to save the people from Lord Indra.